....its weather. We get so transfixed on our model predictions. Yet we still believe predictions out 10+ years. There are weather predictions from your common weatherman. There are also predictions from people who possess a level of intelligence and knowledge that I can't fathom. Nor can the common weatherman. Numbers being crunched, calculations, systems swirling in their brains keeping them up at night pondering what may be in store for the climate given the variables at hand. I tend to listen to those people, not disregard their conclusions and throw them in the pile of your common weatherman. We listen to those people when engineering a building. We listen to them at the doctors micro surgery dept. We listen to them when building a satellite to orbit planet earth. We listen to the researchers editing DNA/building A.I/building quantum computers. Those gifted with the intelligence and motivation to push the boundaries of discovery. When it comes to the climate why do we not listen to them? The human race is probably a galactic miracle. Our civilisation exists in a delicate temperature zone, sure we would survive in a hotter world, our civilisation may not. And that would be a cosmic shame to look at earth in 5000 years and see scattered mad max style human tribes roaming the cooler regions of earth. All the cities and magnificent achievements forgotten and decaying. And those are my thoughts for the moment, back to the weather! Woolshed W of Townsville around 1,725mm for this event so far, Mt. Isa out west approaching half it's annual rainfall in the first few days of Feb. May not be country-wide (as is the case with a true La-nina pattern) however widespread stuff and more to come. Drought would be well and truly over now for the NW of the state. Newer model runs trying to bring the system further south through inland QLD than previous days which is a positive sign, may give areas like Boulia who have struggled for years a decent soaking. As Funkys animation shows, Nino1.2 looks to be warming over past week, imo due to weakend trades down that way. In fact the trades across the Pacific are weaker over past week (and set to remain that way for 6 days more going by EC/GFS on Windy site). Appears to be an actual WWB from N.G. through to the dateline. Looks very Nino'ish to me. The only counter to this is the cooler waters rising into the Nino.3 E side - but shouldnt influence the values in Nino3.4 zone imo. The present monsoon over Aus seems to be cut-off from the general monsoon system(s) with the ITCZ located across Indonesia/N.G. by the SatIR. I do not think we will see much change until the South American coast cools down. I don't see much change until that Tasman sea heat blob breaks down. geez, it's gone quiet in here. Unprecedented climate records being broken everywhere and it's tumbleweeds blowing down the Main Street. I dunno, it was dry last spring/summer and the one before that and the one before that and that heat blob was not there then. Seems to me there is a million and one reasons why it refuses to rain like it did in the past. To get so many failed spring/summers in a row is quite unusual. it was wet last spring and the heat blob wasn't there.....that was during borderline La Nina conditions. the heat blob developed early summer and rainfall failed. It was wet this spring and the heat blob hadn't developed yet either. I agree there are multi-factorial reasons for continuing failure of summer rainfall south of the tropics. 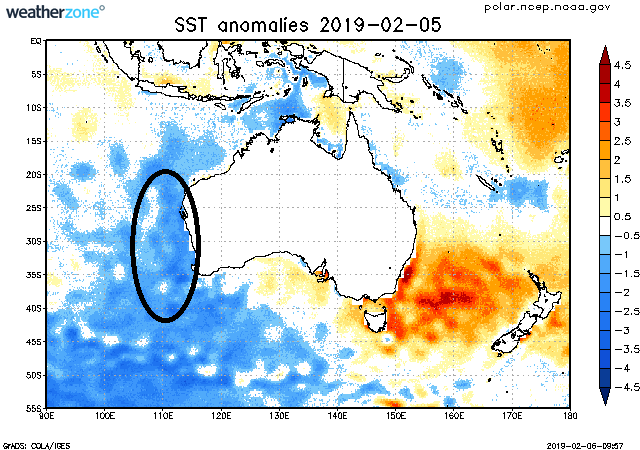 But it does look like an ocean heat issue in the Tasman sea is disrupting the normal flow of moisture laden E to SE winds onto sub-tropical areas. Tasman look similar to this time last year. I wonder if this winter will be the same as last? High move back over the mainland bringing cool SW winds to SE Australia. Completely agree with you MM. As soon as I saw the redevelopment of that warm blob a couple of months ago I became worried. I'm skeptical that the GOC is presently shown as anomalously cool at the moment. It is 31C. Flowin, can you post the actual SST map for the above pair of dates? This is what a hot northern Australia waters looks like. and today. Looks ENSO neutral atm, with a watch on water temps at Nino3.4 should they rise. The first hint of subsurface warmth coming back west to the north of the equator has appeared in latest charts. Also the current WWB is strongest south of the equator, which is a typical el nino decline pattern. However generally the westerlies along the equator are still substantial and have persisted for nearly a month now. Short term forecasts suggest some weakening of westerly activity this week, and further intensification of the WWB in the second week. 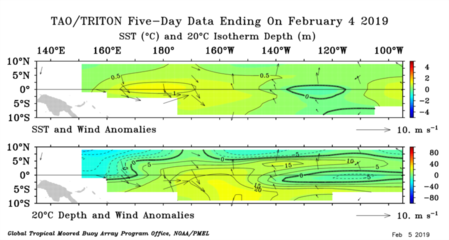 CFS weekly suggests a very strong WWB persisting throughout February. There would seem to be prospects of the current WWB pushing the Pacific into a moderate el nino event early in the year with potential for an extreme event if it continues building. Especially if the weekly CFS forecast verifies, although I'd say that forecast should be taken with a grain of salt. Also hard to tell exactly how this WWB will interact with factors that tend to destroy el ninos this time of year though. That WWB is looking like Groundhog Day just about the same time last year within a week or two ....and the year before as well. Actually is there any year over the last few say three or four that got things right ? WWBs occurred this time of year (Jan-Mar) in 2014, 2015, 2016 and 2018. All except 2016 resulted in significant warming in the next few months. 2016 was the tail end of an extreme el nino with most of the WWB restricted to south of the equator, and with subsurface warm anomalies stacked heavily to the east - typical el nino decline mode. 2018 was far weaker than the other WWBs and I didn't even notice it or comment on it at the time, but only afterward when it warmed in the east did I look back and consider that a weak WWB had occurred at the correct time to be a possible factor. I had commented a while ago that the Ningaloo Nina seemed to be weakening, but looking at latest SST is seems to be back. Big pile of cool SSTs further south of the region too. Temperature gradient between cool waters to the west and warm waters to the east would be enhancing westerly activity in this region of the world. With MJO out at 6/7 atm, there is no cloud over the Pacific in that region going by latest SatIR. 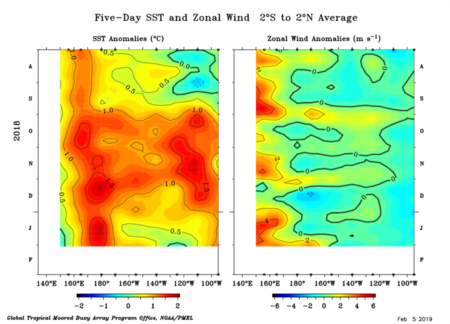 Easterly (well ESE'ly) trades look to have returned to typical levels over Nino1.2 (which did warm, even over the top of cool lower layers during the lull over past 4-5 days). Suggests to me that the uncoupled atmosphere look to continue, and that MJO will either go null in coming days, or zip along to phase 8, leaving Aus to stew in its present monsoonal conditions for at least a week or more to come. 4 registered (crikey, Dan101, LonnyDave, Adaminaby Angler), 64 Guests and 3 Spiders online.